Despite its title, this box set is almost entirely unrelated to Big Finish’s previous UNIT mini-series of seven years ago. The characters from that last outing, such as Colonel Emily Chaudhry, have all been replaced by new personnel. These include the media-courting Colonel Lafayette (Julian Dutton) and Sergeant Pete Wilson (Bradley Gardner), whose anxiety over his pregnant wife’s imminent labour lends a human angle to the troops, who have often been portrayed as mere cannon fodder in the television show. The staff roster also includes one Elizabeth Klein (Tracey Childs, last heard from in The Architects of History) as UNIT’s scientific advisor, a position the Doctor himself once held. Her back story as a Nazi scientist from an alternative timeline she can no longer remember is a complicated one, but it need not dissuade new listeners, as all is clearly explained over the course of this four-disc adventure. Though no longer a baddie, Klein remains a decidedly sardonic character - the opening banter between her and Lafayette is highly reminiscent of the Third Doctor’s interaction with the Brigadier. Perhaps the biggest difference to the former UNIT series is that this time the Doctor is involved - twice over, in fact. First there’s the Seventh Doctor (Sylvester McCoy). He is accompanied by Raine Creevy (the charming Beth Chalmers), who was resumed her travels with him following her appearance in a handful of Lost Stories releases, though there is also a minor role for Ace (Sophie Aldred), who sends them a garbled message of warning. Intriguingly, Ace’s messages are sent from Gallifrey, where she is said to be undergoing training, a character arc from the unmade Season 27, which could also be interpreted as a link to Death Comes to Time. Thus the box set picks up various plot strands from previous Seventh Doctor sagas - the Klein trilogy, The Lost Stories, Ace’s departure in Season 27 and/or Death Comes to Time - and runs with them. Even more intriguing is “the Other Doctor” (Alex Macqueen), who appears to be a future incarnation of the Time Lord. Having hitherto seen Macqueen playing straight-faced roles in The Inbetweeners and The Thick of It, I was unprepared for quite how eccentric his Doctor would be. He demonstrates this from the outset, with his enthusiastic “Hello, you!” but later reveals a darker and more complex side. I loved the performance, which owes something to the new television series, and I hope this isn’t the last we have heard from this character. Distracted by the story’s inter-dimensional angle, I could have kicked myself for not guessing the big reveal, though the clues are there. As with the fate of Ace, co-writers Nicholas Briggs and Jason Arnopp leave some unanswered questions surrounding “the Other Doctor” - they are deliberately vague about precisely when he comes from in terms of Gallifrey’s timeline. In addition to its characters, the other way in which this box set differs from the earlier UNIT series is in terms of scale. 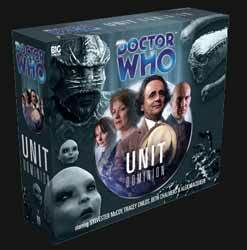 Whereas previous Big Finish mini-series, including box sets, have tended to comprise a number of linked adventures, UNIT - Dominion is very much one big, epic storyline. There is a slightly episodic flavour to the procession of freaky inter-dimensional incursions that Earth suffers, but there is a clear through line and the stakes keep on getting higher, with UNIT facing Mind Leeches during Disc 1, eerie Skyheads (giant, floating baby bonces) and deadly Lava Spiders on the second disc, and simultaneous attacks by the squid-like gestalt Nexus and some flying alien cubes during the globe-trotting Disc 3. The latter are unfortunately slightly similar to the slow invaders in UNIT’s recent screen comeback, The Power of Three. In behind-the-scenes interviews that occupy an entire bonus disc, Briggs (who also directs) remarks that Dominion’s duration is equivalent to that of UNIT’s eight-part debut serial The Invasion. In fact, it is even longer, coming to four hours (not counting the bonus disc), which is closer to the running time of The War Games. However, the pace rarely slackens. This box set is a special release in every sense. Perhaps I shouldn’t speak too soon, since I haven’t yet listened to Dark Eyes, but this UNIT operation might just claim dominion over them all.